Is the fog lifting? Nope…it’s getting thicker! 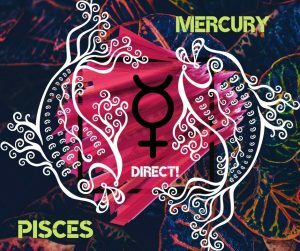 On the 28th of March Mercury will station direct at 16°05’ Pisces, a direct station after three weeks of retrograde is usually a cause for a huge sigh of relief from many of us. Unfortunately, not so this time since Mercury stations directly on Neptune (16°57’) which means more confusion due to day-dreaming and fuzzy thoughts in general. Mercury entered Pisces on the 10th of February so by now we should be aware if not accustomed to the dreamy nature of this sign – have you been feeling mentally fuzzy too and how thick can the fog really get? The persons most affected by this period will have been those with planets and/or angles between 29-14 Gemini and Virgo as well as the other two mutable signs of Sagittarius and Pisces. Gemini and Virgo, both ruled by Mercury, may respond differently to the signs their ruling planet moves through on its apparent journey backwards. Virgo, being an Earth sign, mixes more willingly with the Watery signs, acting as a container for them and, forming an opposition to Pisces, there is often common ground upon which to work out a compromise upon. Gemini, an Air sign, finds the Water signs very confusing and Pisces particularly so since they face each other at 90° in the zodiac, Air signs are rational, emotions disturb them, Water signs are empathetic they understand reason and logic with great difficulty so this retrograde will certainly be harder for Gemini than Virgo. I can personally vouch for Geminis having had a harder time during this retrograde, for me, events have taken weird and unexpected turns over the last month and thinking over them has only come up with other impracticable or non-solutions. It seems that the harder I try to unravel things the more complicated they seem to become. How have you been coping with this period? The Sabian symbol for 17° Pisces: “An Easter Parade.” Indicating the capacity inherent in all great sociocultural images to unite the members of a community in a display of excellence. Was your chart involved in this Mercury retrograde period? Care to share your story?